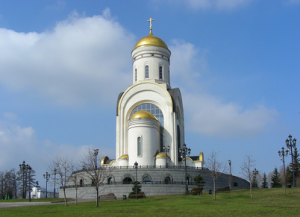 The Orthodox architecture is influenced by the architecture of the Eastern Roman Empire and Byzantine and has a particular style when it comes to the church building. Even though it was hard to make a selection of 5 most beautiful religious buildings in and around Moscow, we hope you will like our list. The Cathedral of Christ the Saviour – is the world´s tallest and one of the most beautiful Orthodox churches, because of its simple structure and three magnificent gilded domes. The original church was built in 1883, but it was destroyed on the order of Joseph Stalin in 1931. The church was rebuilt between 1995 and 2000. The Church of St. George the Victorious on Poklonnaya Hill – The church was built in 1995, in the memory of WW2 commander Georgy Zhukov and his protector St. George. Its modern structure with large arches and gilded dome leaves the equally great impression on both believers and tourists. The Church is the part of the outdoor war museum. The Holocaust Memorial Synagogue on Poklonnaya Hill – This Jewish temple is a part of the outdoor museum dedicated to Russia’s victory in World War II, also known as the Temple of Memory. It was built in 1998 beside Orthodox church and a mosque. The temple is also used as a museum and exhibition space in memory of Jewish history and Holocaust. The Trinity Lavra of St. Sergius – It is the most significant Russian monastery and the spiritual center of Russian Orthodox Church. The complex is established in 1345 by Sergius of Radonezh 70 km from Moscow, and today it is the home of 300 monks. Besides, it is under the protection of UNESCO World Heritage. It includes beautiful buildings with blue and gilded domes. The Church of The Icon of Christ of Edessa in Klazma – This church is built in Art Nouveau style, from the outside the church has the original and familiar motives. However, the inside of the church is very simple comparing to the other churches, and its architects were focused on shapes rather than colors and patterns.